For the past month we have held our annual wreath making workshops and, like usual, we had a blast at every single one! We are always blown away by the beauty these ladies create! The night always starts with a little wine (to get the creative juices flowing) and then chaos ensues as fresh greens and berries fly all over the shop while they get to work on the masterpiece. We like to use grapevine wreaths because not only can you use them year after year but they are also easier to adorn because you are not dealing with wiring in your greens and textures. Each wreath turns out different and that's what we encourage and love. We want the end product to be a direct result of their own creativity and we are always impressed. Here's to looking forward to many more workshops at Sage in 2017! I know our blog posts have been far & few between, but we have been so busy at Sage (which is a good thing!). I am starting play catch-up on everything that has been going on so we can get to present time and start blogging in real time! Back in August we hosted a Roses + Rosé Event at the shop. It was such a fun night filled with, you guessed it, roses and rose! As guests sipped on some delicious varieties of the pink-hued wine they also created incredibly beautiful arrangements made up of roses and greenery. Our good friend, Maryjo, came up with this fun end-of-summer soiree, she definitely knows how to throw a good party! If you don't yet, follow her on Instagram @port2palm. She invites you into her gorgeous homes in Newburyport and Isle of Palms, SC and you get to see the sweetest pics of her family, her dogs and her fun-filled life on the East Coast! Another good friend of ours, Kate from Freebird Photography, was here that night to snaps some photos of the event. Kate has an amazing eye and takes the most fun photos (she also was my wedding photographer!). She's another account you will want to start following on Instagram asap @wearefreebird. We will be rolling out a list of workshops for this Fall and Winter soon! Make sure to sign up for our emails to be up to date on the workshops as they fill up fast! Cheers! On Tuesday I was lucky enough to attend a styling workshop with Joy Thigpen at Ceremony in Boston, hosted by Alexis of The Little Things. If you have never heard of Joy Thigpen start googling. She is the master of all things aesthetic and styling. Joy started off her career as a photographer but quickly realized she would rather be in front of the camera making sure the pictures are as beautiful as they can be and she does one amazing job. Listening to her talk about aesthetics and what goes into making a beautiful image completely opened my eyes and my creativity and plus being in Ceremony for the day didn't hurt at all (seriously one of the dreamiest spaces I've been in. I highly recommend visiting if you can or at least follow them on Instagram). We started off with a meet and greet and then we got to listen to Joy talk about what makes a beautiful image, well, beautiful. Next we got to watch her in action as she took a set of beautiful wedding stationary (created by Gus & Ruby Letterpress out of Portsmouth) and positioned every piece so carefully for a photograph. It was intriguing to watch her in action and be a witness to her thought process. Each of us then got the chance to style our own stationary and the very talented Ruthie from Ruth Eileen Photography took a photo of each of our work for our portfolios. Next up was florals. There was a table covered in the most beautiful, fragrant flowers and again we got to watch Joy work her magic and talk us through her process. Then it was our turn and, again, once we finished Ruthie took a shot of our work. I can't wait to see these pics and add them to my portfolio! We finished the day with a casual Q & A with Joy and we got some insight on all the amazing things she's working on right now. 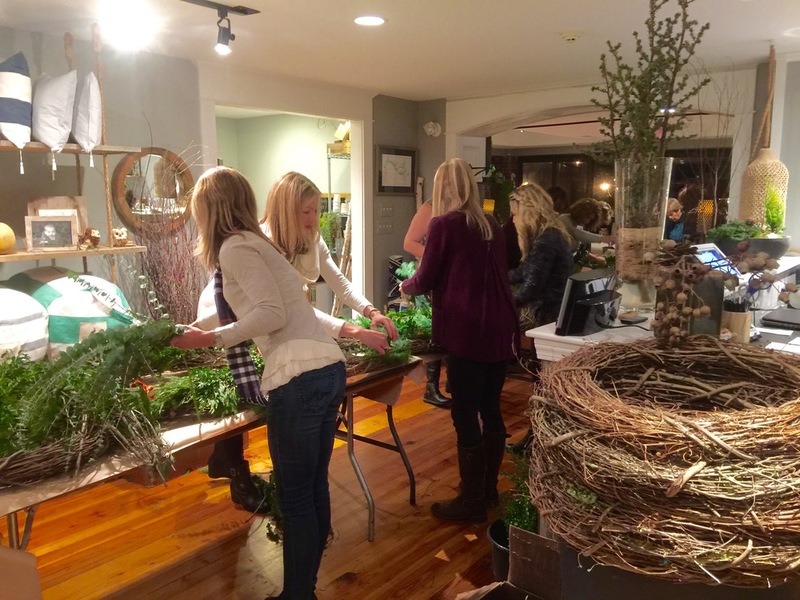 We had our second wreath workshop & it was another great night! These women did such an incredible job on their wreaths and had a blast while doing so! Our favorite part of these workshops has been seeing the uniqueness & beauty in each wreath. 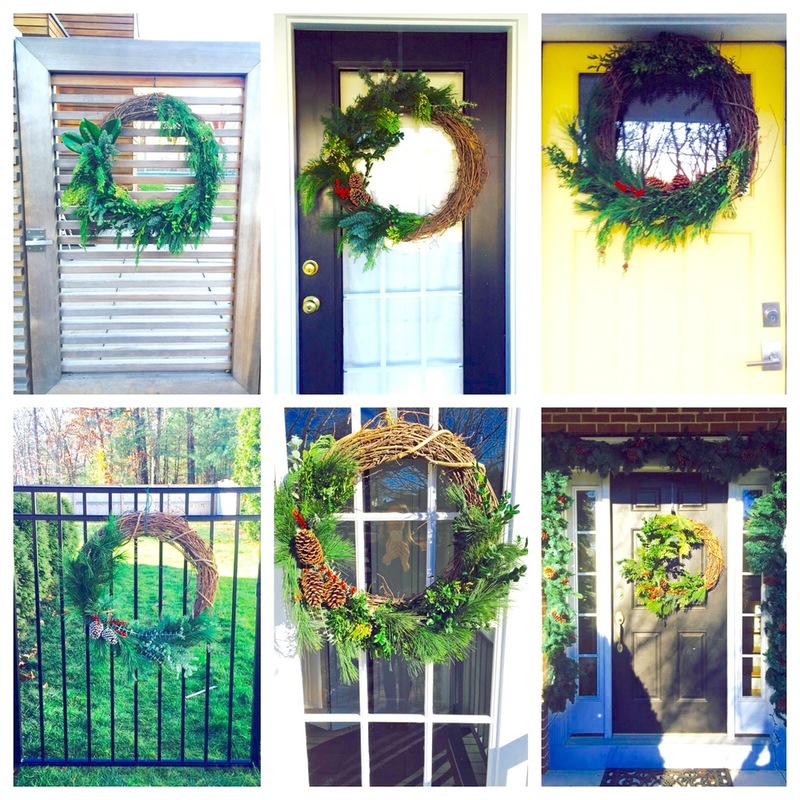 We especially loved getting pictures of the wreaths on everyone's doors! We had many laughs over the two nights & can't wait to do it again next year. We had two dates for the wreath making workshop this year but since it was such a hit we will make sure to add more dates next Holiday season! 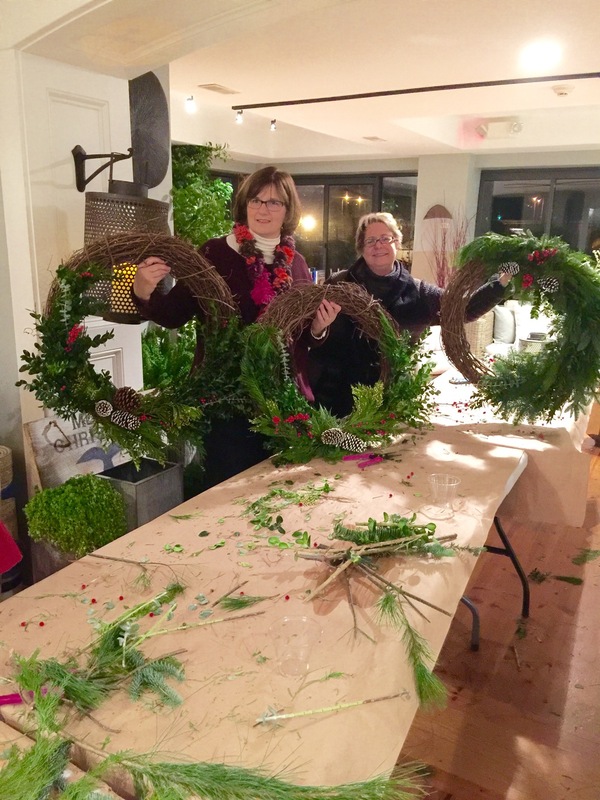 Last night was our first wreath making workshop at the new store & we had such a great time! Surrounded by grapevine, boxes of greens and pinecones and branches of eucalyptus & berries, 16 creative ladies made wreaths to adorn their homes for the Holidays. We were blown away by the different wreaths, each one being unique & so beautiful! Looking forward to many more workshops in 2016!